Dr. Mohamed Katoub may have originally trained as a dentist but as the horrors gripped his hometown he found himself trying to keep a hospital running in a war zone. In the five years of Syria's civil war, Katoub survived chlorine gas attacks, made do without electricity for months on end and moved hospitals and schools underground to protect children from bombs dropped by President Bashar Assad's forces in rebel-held Douma. But the hardest part, he says, was the simple lack of food. “Every day we received a child from one of the schools around the hospitals suffering from a coma because of lack of nutrition,” Katoub told NBC News. “What would you say to a mother when she came to a hospital to take her son after such an incident. When she cannot feed herself, how can she find food for her kids?" According to Katoub, 170 people died of starvation in his besieged area — which is located just outside the country's capital of Damascus. “The very basic needs became a luxury now in Syria,” he added. Katoub fled to Turkey in 2014 and now works for the Syrian American Medical Society. But the grim reality he describes remains across much of Syria. The United Nations says 13.5 million people there are in need of humanitarian aid, with 400,000 living in places that are under siege from government forces, rebel groups or ISIS. At least 250,000 people have died, but the UN stopped counting in 2014. Tuesday marks five years since demonstrators first took to the streets in anti-government protests, putting Assad squarely in the path of the Arab Spring movement that had already challenged the deeply entrenched governments in Egypt, Tunisia and Libya. Robert Ford, the U.S. ambassador to Syria at the time, said the protest movement was not initially aimed at toppling Assad. The government began opening fire on protesters, and detaining leaders of the anti-government movement. Forces aligned against Assad began to form a loose consortium of militant groups that included Islamist fighters as well as members of the more moderate opposition. The first battle lines were drawn. Over the coming months and years, the conflict began to pull in fighters and militaries from the around the world including the U.S., Russia, Turkey and Saudi Arabia, as well as a brutal group of international jihadists calling themselves ISIS. It seemed everyone had a battle to fight in Syria, and civilians, as usual, were caught in the middle. A cease-fire agreement brokered with the backing of the United States and Russia, and word that Moscow has ordered its troops to begin withdrawing from the country, has provided hope for a lasting solution. But so much is already lost. More than 7 million Syrians have been displaced inside the country and 4.8 million have fled, according to the UN. Among them is Sleman Shwaish, who came to the U.K. from Aleppo — Syria’s second-biggest city, its commercial capital and historic heart of the country. Today, the city is divided and broken, a snapshot of the broader conflict. Syrian regime forces surround the city from the west, while opposition forces control another one half. Kurdish forces also control a pocket of the north and ISIS is encroaching from the east. The city’s ancient citadel, dating back to the 3rd century BC, is again being used as a military garrison, the city’s picturesque souks and mosques are now lying in ruins. 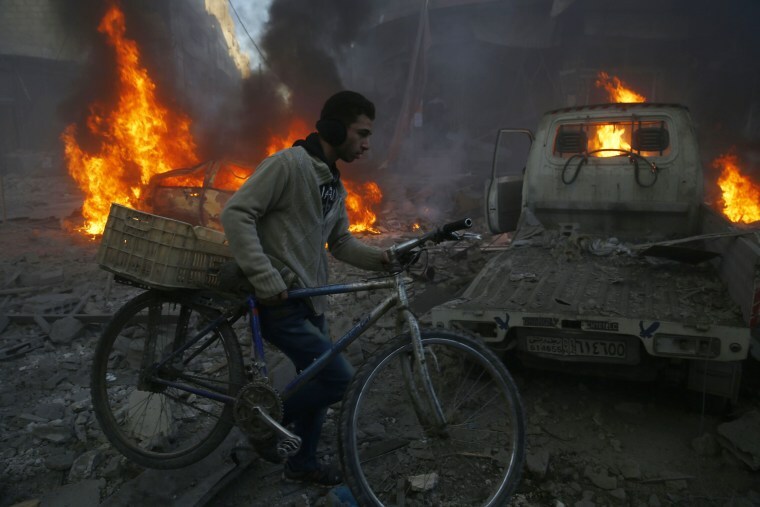 “You can smell the death everywhere in Aleppo,” Shwaish told NBC News. A student in engineering and food sciences, he says he was afraid he would be drafted into Assad’s army. He decided to leave in 2012, following a heart-to-heart talk with his father. Like so many others seeking a better life outside of Syria, he left the country, headed for Europe. Photos of the drowned Syrian toddler Aylan Kurdi, who washed up dead on the shores of Turkey, struck a nerve across the continent. But security fears rose after the attacks in Paris by ISIS-linked militants, including some who are believed to have traveled to Europe via the refugee route. A spate of sexual assaults on women celebrating New Year's Eve in the German city of Cologne was blamed on groups of migrants and stoked mistrust. Europe last year took in more than 1 million refugees and migrants, many arriving by boat from Turkey to Greece — a trip that Aylan, like thousands of others, did not survive. But European authorities are now closing down refugee routes and sending troops to some borders. Shwaish now volunteers with the Red Cross in the U.K., trying to help other navigate the difficult journey to asylum. He says refugees no longer feel welcome. The international community sees some hope in the cease-fire deal that includes most of the major parties to the war, but exclude ISIS. Peace talks resumed in Geneva Tuesday, but the U.N. negotiator Staffan de Mistura has warned that if the process fails, there is no “Plan B” other than a return to war.